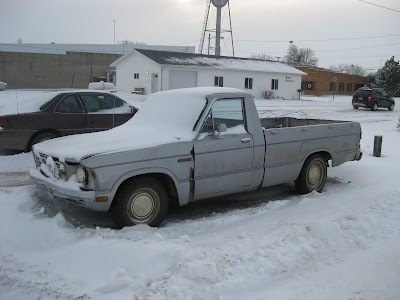 Up here in my Christmas destination of North Dakota, the 10 months of winter acts as a cryogenic preservation process for cars that have otherwise dissolved in nearly all other areas. 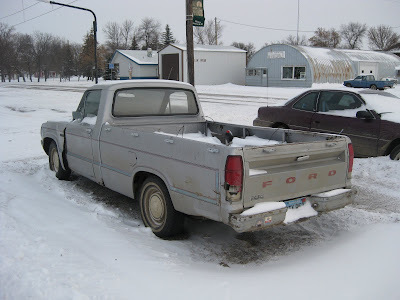 Case in point: this second generation Ford Courier pickup. Based on the Mazda B2200, which people actually bought, these trucks were designed to compete with the Dodge Ram 50, Chevrolet LUV, Nissan 720, Toyota Hilux and other small pick-ups in "Mini-Truckin'" segment of the mid-70's. This one appears to still be used as a Sinclair gas station service truck. It's clearly ragged out but the body seems mostly ok - even the bed is solid. Hopefully, it's the Perkins Diesel version but that may be too lucky a find.